David said I should write an introduction post. Soooo… we decided to start a blog. ::insert sheepish look here:: I’m both super proud and also kind of embarrassed. This has been so much fun to setup and we have so many ideas to get started on, however, I also feel like some kind of fraud. People been telling me for years that I needed to start one. I read about 10 of my favorite home blogs religiously everyday. But to write our own? It just doesn’t feel right. I don’t feel like I’m creative/entertaining/interesting/innovative (the list goes on) enough to do this. But here we are. And I’m so excited to be doing it. I’m looking most forward to getting all of our projects in one spot and telling some stories that our Facebook before and after albums aren’t able to do. I feel like we’ve done so little and so much when it comes to home stuff. And that’s what it’ll mostly be about, our journey so far in home DIY, decor, and renovations… and all that is to come in the future with this “forever” home that we’ve started to finally settle down in. But we also plan to just blog about things going on in our lives and other hobbies every once in a while. The name sounds silly… “Hams at Home.” But we love it. I know it’ll probably get misinterpreted for a tasty and salty meat dish sometimes served at Christmas dinner to the unfamiliar (if anyone other than family and friends ever actually decide to read this blog). Over the years we’ve had fun with different hashtags: #HamsRenovation #HamsdoNewZealand #HamsMoveToDE and most notably, #BabyHam2016… so we decided to draw from that. The alternative was “Relocation Renovation” since we’ve been relocated by our jobs 3 times now. I kind of loved it, but felt that it didn’t accurately describe where we our in our lives now, considering that the long term plan is no more relocations and making our current Delaware home our “forever” home. At this point, we’re tired of moving. Although we’ve never had to actually pack and move ourselves (thank you relocation money!) the unpacking and settling in process was enough. And now that our little family has grown a bit more, it’s so nice to be around grandparents, aunts, uncles, and long time friends. That kind of stuff is just invaluable. So here we go. 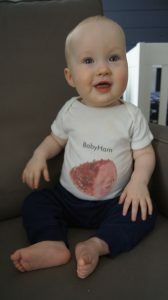 Here’s to the future of Hams at Home! We’d love some feedback if you’re up for it. Let us know what you think of the page (good and bad!) and any topics that you may want to hear about. Carolyn! This is awesome, I’m so excited you started a blog. I love seeing your before and after pictures on Facebook, can’t wait to read more about them here! Are you going to do posts about the previous houses you’ve renovated? I used to follow tons of blogs but when google reader was taken away I stopped (and also pretty much stopped blogging myself). I have no clue why they killed that project. I tried feedly but couldn’t get into it, maybe I’ll try again. Thanks so much, Meghan!!! I remember reading your blog and thinking, how is she managing doing all of that cool stuff in grad school?? Haha. Feedly definitely required some transition but it fulfills my needs now! I feel like they made it similar to google reader now so that helps.